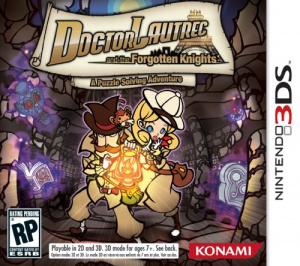 Sorry, no review of Doctor Lautrec and the Forgotten Knights yet. Enter 19th century Europe and the world of Doctor Jean-Pierre Lautrec. He's a brilliant, eccentric, sarcastic professor with little or no friends but a healthy obsession for solving mysteries. One day, a woman named Marie visits Lautrec bearing a curious gadget. The mysterious map that the gadget displayed seemed to point the way to a fantastic hidden treasure belonging to Louis XIV of the House of Bourbon, a dynasty that had collapsed a century earlier. As they search for the treasure, they find themselves targeted by a mysterious man named Vidocq. They are blocked at every turn by the Knights of the Iron Mask, a mysterious group of men with iron masks and claws. And then they must fight the Treasures Animatus. 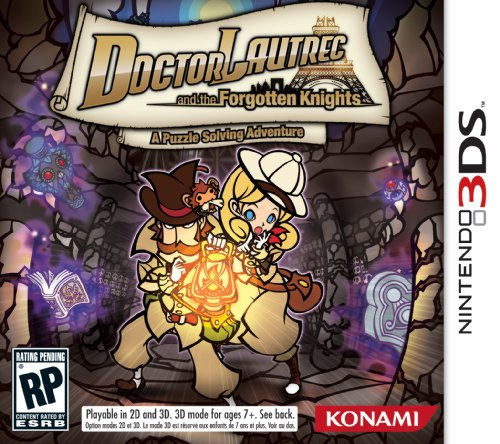 Work as Doctor Lautrec, aided by his perky and emotional sidekick Sophie, to unlock the mysteries within and search for the lost treasure of Louis XIV. Search for clues, solve puzzles to unlock new mysteries and gain more information as the quest continues. 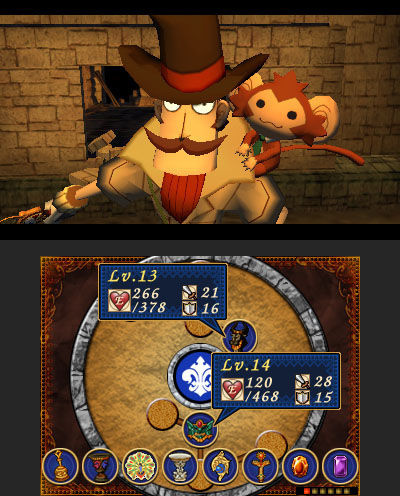 The story is told in both 2D and uses the power of the 3DS in 3D to enhance game play giving gamers the ability to look around for clues like they're in the game. 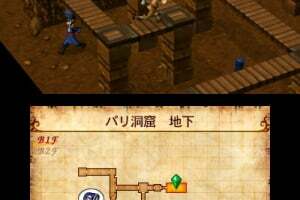 Journey through single player Story Mode or link up with up to 4 players in Treasure Hunt Mode to collaborate and compete against each other. Immerse yourself in the world of Doctor Lautrec where mystery and adventure can be found around every corner. Obviously inspired by Prof. Layton. 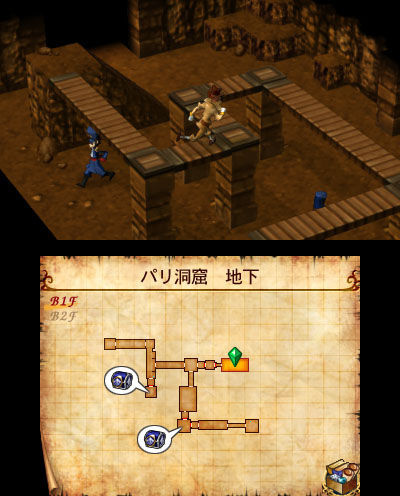 Hope its not a copy-off Layton but a good imitator like Sonic to Mario. May get this if reviews pass it as good. @2: Its Professor Layton. btw, when will there be a review of the game play? 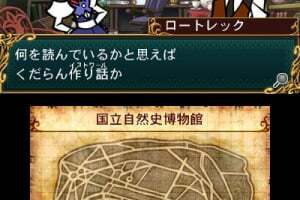 While I admit that the first impression points toward a Layton knock-off, it really turns out to be something else entirely. 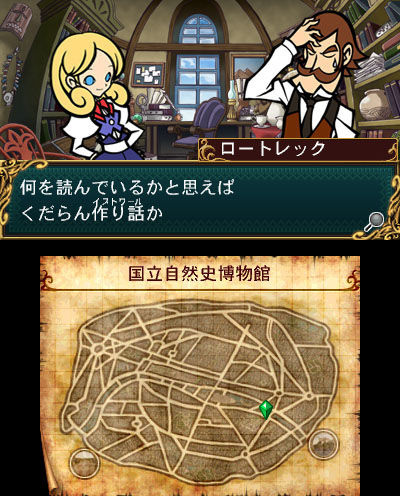 Where the Layton games entirely focus on puzzles thrown in just about everywhere, Lautrec actually has maps and a bit of action mixed into it. Another good call is that Lautrec is an Archeologist doing his job (unlike our top-hatted gentleman, whose paycheck contents are a puzzle in itself), so the plot focuses on such and almost gets an Indiana Jones feel every now and then. Lastly, the game has much quirkier characters and humour, as well as a distinctive art style much more reminiscient of the Puyo Puyo style. 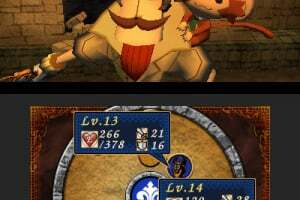 So, saying that this is a Layton clone is like saying oranges are like lemons: similairities are there, but the flavor of both is absolutely different.